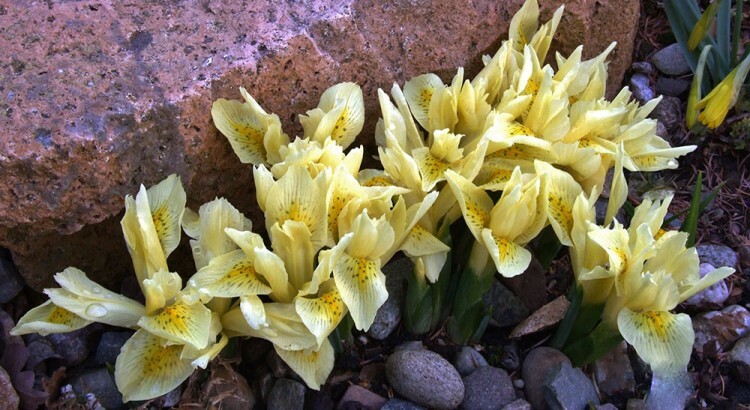 For many years I have grown this exquisite subalpine iris species belonging to the Reticulatae section, but I never feel as if I have found it easy or have I grown it to a sizeable clump. Right now it is increasing well! This is a rare species in nature, native to a few stations in the Republic of Georgia, or more specifically in the southern Caucasus Mountains. It is undoubtedly more common in cultivation now, than in nature – belonging in the Red Data book. It chooses to grow in dampish meadows and pockets of humus amongst rocky outcrops. Here then is a clue as to what it prefers in our gardens. An acid humus-rich soil in dappled shade will suit it best and at no time should it be allowed to dry out completely. Here is a word of warning for those who prefer to grow it in a bulb frame or in a pan in the alpine house. New root growth begins in the summer, so it should only be handled as the leaves begin to disappear. The striking flowers are pale primrose yellow in colour with golden freckles and narrow orange crests to the falls. It is in full flower now (as I write 2.3.2014) and will reliably do so towards the end of February and early March in the open garden. As to propagation of this desirable species, established clumps can be lifted and divided as the leaves die back. Lift the entire clump being careful not to disturb the baby bulbils at the base of the clump. These rice-like bulbils can be carefully separated and scattered on a few inches of well-drained compost and then covered with the same amount of compost and finally top-dressed with grit. Label well and keep moist. As the bulbils develop, be generous with well-diluted tomato feed when the leaves are present and shortly after they have disappeared. Keep replenishing the compost until the bulbs are mature and ready for their final home. Look out for seed capsules and sow ripened seed as soon as it is ready. It may hybridise – recall the fine hybrid Iris ‘Katharine Hodgkin’ or produce some lovely variants, perhaps a fine albino! !